Non-enveloped, round, T=1 icosahedral symmetry, about 17 nm in diameter. The capsid consists of 12 pentagonal trumpet-shaped pentamers. Monopartite, circular, ssDNA genome of about 1800 to 2000bp. The genome is replicated through double-stranded intermediates. The replication (Rep) protein initiates and terminates rolling circle replication, the host DNA polymerase being used for DNA replication itself. There is a potential stem-loop structure in the intergenic region that includes a conserved nonanucleotide sequence (AGTATTAC) where ssDNA synthesis is initiated. The encapsidated viral DNA and the complementary DNA of the replicative intermediate encode two mRNAs for the Rep and capsid proteins. Rep mRNA can undergo alternative splicing in some strains to produce Rep' protein. 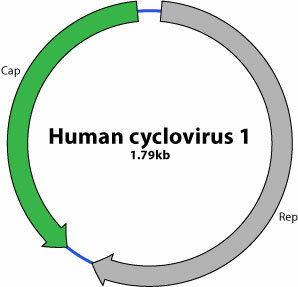 Virus penetrates into the host cell probably by clathrin- and caveolae-independent endocytosis.